Kilvemnon is two miles south-east of Mullinahone and close to Tipperary's border with Kilkenny. 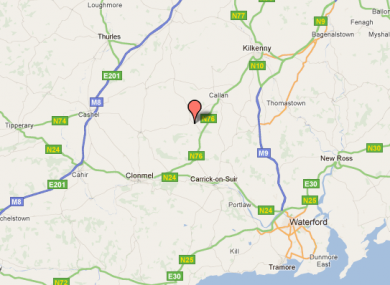 A MAN IN HIS 40S is in a critical condition after a light aircraft crash in Co Tipperary. The accident occurred shortly before midday, when the two-passenger plane came down in a field at Kilvemnon, near Mullinahone and close to the county’s border with Kilkenny. The man in his 40s was immediately taken by air ambulance to Waterford Regional Hospital, where he is in a serious condition. Another man, aged in his 50s, was removed by ground ambulance and is said to have sustained minor injuries to his leg. An air accident investigation team has been notified and is on its way to the scene. Email “Man in critical condition after light plane crashes in Tipperary”. Feedback on “Man in critical condition after light plane crashes in Tipperary”.